Will Australia's modified Deus Ex be a Wii U title? 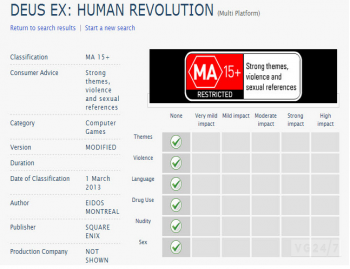 A recent Australian reclassification of AAA title Deus Ex: Human Revolution may point to a Wii U port. Or possibly a repackaging, or something else again; but in any case, the MA15+ rated title is going to get a re-release soon. The only question is, what kind of re-release will it be? It may just be that Australia's about to get a re-issue with all the DLC, including Missing Link, in which Jensen faces off against a new arm of the Belltower threat at Rifleman Bank Station. However, not that long ago Australian Wii U developer Straight Right mentioned that it was working on a port of an unnamed AAA title. All Straight Right's Tom Crago was willing to say at the time was that it was "based on another big franchise that will come out in 2013. It's a big title and you will have heard of it." A NeoGAF slip was later taken to mean that the Straight Right title would be a Square Enix game, and so we come to Deus Ex. Deus Ex: Human Revolution, for those of you who somehow missed its 2011 launch, is a cyberpunk futurist game in which you play as Adam Jensen, head of security for biotech firm Sarif Industries. Sarif has more than a few enemies, and a first strike on Sarif's headquarters to extract scientist and love interest Megan Reed leaves Jensen near death. Surgical intervention, and biological augmentation, saves Jensen's life, and he goes off on a mission to find those responsible for the attack. Just recently, Square Enix filed a trademark claim for its latest instalment in the Deus Ex storyline, Human Defiance.